Last week I asked if anyone would be interested in participating in a little embroidery swap, and to be honest, I was overwhelmed (and so very happy) at the response! Thank you! But whether you've already expressed an interest, or if this is the first you're hearing about it, I'd like to officially invite you to be a part of the first ever Wild Olive swap! We'll each be creating a small piece of embroidery, and mailing it off so we can each receive a bit of hand-stitched happy mail! It seems to me that no matter how much technology we have, receiving a little package in the mail from a real person somewhere in the world is still magical. This is going to be a swap of embroidery in a 4" hoop. I find this to be a cute size, very manageable and inexpensive to mail. You could complete a piece in an afternoon at this size, or take more time and make it more complex. This is up to you. And you can embroider anything you want, although, it might be nice to take into consideration what the recipient might like (to this end, I'll be gathering some info in the sign up that will help with this!). Also, Wednesdays in March, I'll be sharing posts related to the swap, including some pattern links, finishing techniques, and some extras. I'm really looking forward to it! • Finished embroidery should be in a 4" hoop, prepared for hanging. 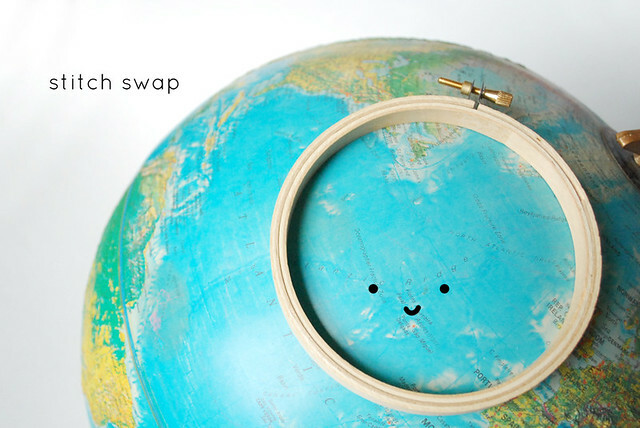 • This swap is open to all, so you should be prepared to mail your embroidery internationally. • You are welcome to include a little something extra, but it is not required. Please spend no more than a few dollars. • All pieces should be mailed by March 31, 2012. Instead of partnering people up, this is going to be a circular swap, meaning Stitcher A sends to Stitcher B, who sends to Stitcher C, who sends to Stitcher A (but with more than 3 people, I'm guessing!). Make sense? On March 1, you'll receive an email with the information of the person you'll send to, but not of the person you'll receive from...that'll be a surprise! I'm stitching too, so at least one of you will get something from me! Questions? Ask in the comments, and I'll reply in the comments. Could you explain what you intend by "prepared for hanging"? Do you have a photo to show what this would look like? There are lots of ways to do this, and I don't want to limit creativity too much. Think of how you might want a piece to ready to hang in your house. Some of my embroidery is in a plain hoop with the fabric edges gathered in the back, some have painted hoops, and some have backings that I've made. Just so long as the embroidery is "finished". Eek this is so exciting! Will there be a blog button for the swap? I cannot wait! Yes...that will be coming next week! I am so excited! As soon as I find a 4" hoop I am signing up! Looks like fun, before I commit (or am committed for taking on another commitment...LOL)Are there guidelines for the actual piece? Like embroidery only or "felt embellishment is ok", "fabric is not" kind of thing? So long as embroidery is part of it, extra embellishment is great! Awesome!! I am "in"...LOL...Thank you!! I'm so excited to partake in this! I think (?) I have a 4 inch hoop. If not, how hard can it be to find? It shouldn't be too difficult! I'm so excited for this swap. Wild Olive is one of my favorite blogs. Are you going to set up a flickr group? That's been a fun way in past swaps to secretly see the kinds of things your partner likes and share progress/ideas. Yes...I'll set it up soon, and post the link next week. eeeep!! This looks like so much fun!!! I am nervous but in! Is this swap ok for people who have only recently fallen in love with embroidery? If they promise to do their very best and not send out a piece of garbage? also, i accidentally submitted the form without filling in the 'motifs' section - would it be best if i re-submit or if i just made a note here? You can leave a note here, and I'll add it to the form data. Thanks! perfect, thanks mollie. really anything geometric, abstract or slightly hunter/gatherer/organic, if that latter combination makes any sense. also, i'd love to post a link to this on my own blog as well, would it be alright if i used the first photo in this post and link to this? i'd love for my readers to join as well! Yes, feel free to use that image (you can now click it and get to it on Flickr), and spread the word! Mollie, I am so excited to do this swap! I JUST posted a blog about how I wanted to start embroidering. This is the PERFECT goal for me, since I wanted to do something in March. I'm really excited now to learn to embroider!! Sweet! I'm so glad that you're joining in! I'm so excited about this, such a great idea..thank you for organising it! Hi Mollie, what a lovely idea! Is cross stitch allowed? Also does it have to be entirely an original design or can I use something from a pattern I have purchased? I would give details of who's design it is of course! Good question! Although cross stitch is a form of embroidery, I think for this swap we're focusing more on hand (free) embroidery work. That said, combining the two could be fun and interesting! Another person asked about applique added in, so I say, adding in some cross stitch would work! And absolutely feel free to use something from a pattern! There are so many good patterns out there to work with, and this is a good time to use them! What an exciting challenge. Should it be hand embroidery or can I use my sewing machine? I like making some experiments in free style overlaying fabrics and drawing with the thread. Does it work for the swap? A combination of machine with hand would be okay, just not all machine embroidery. But I do think that using the two techniques together would be a good mix! Oh excited! I have been doing more embroidery lately so this will be fun. I just need to get some 4 inch hoops now! I'm glad I saw this post! :) I already signed up and can't wait to find out more details. :) Thank you for hosting this. This sounds like so much fun! I'm really excited to participate! I would like to participate but I don´t understrand what is 4" hoop and prepared for hanging....can you please help me? Thank you! The metric equivalent is a 10cm size hoop. To prepare for hanging, think of how you might want a piece to ready to hang in your house. Some of my embroidery is in a plain hoop with the fabric edges gathered in the back, some have painted hoops, and some have backings that I've made. 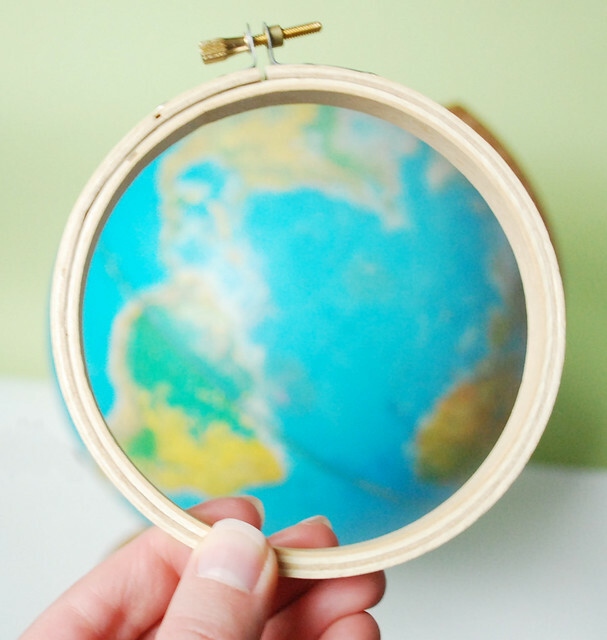 If you can cross stitch, you can learn free embroidery easily! I've got a series of embroidery basics tutorials that will help, and with only one or two stitches, you can create some really lovely work! I am super excited about this! Just the little get-going project for my embroidery ramblings. I will link to you on my blog, and credit your photo. I've secretly wanted to start some hoop-work, this gives me the added motivation! Hooray! I've singed up :D Such a lovely idea! I haven't mailed a hooped piece that size before, but I would guess that it would be about $5 MAX. To give you a point of reference, I recently mailed a package to Germany with 2 hoops, a bunch of floss, and a couple other small things and it was just under $7. I should have said...domestic should only cost $2-3. Because the hoops are less than 3/4 inch thick, the packaging (if there's not too much extra padding) should be considered a large envelope, and that helps keep the cost down. I already buy my 4" hoop! Thank you for this new adventure! I just signed up, such a great idea. Hope you don't mind, I posted this on my tumblr to spread the word a little more. Is this freestyle only? I love using transfers. I really like the detail. Using transfers is wonderful! There are so many good ones to choose from! I am very hapy about this project. I signt up for it but I am not shure if you recieved, coul you look for my name? my name is Paulina Mineiro. Hi Paulina! Thank you for signing up! I did get your information, so you're all set. You'll hear from me in the next couple days with your swap partner's info. I'm so sorry you missed it! But I think it's quite likely that it will happen again in the future. Just wondering if I somehow missed the email or if you are still sending them out? Found it!!!! I must have overlooked it. Thanks again Mollie. I'd be glad to be part of it! This swap is closed, but we'll probably do another one in the future.